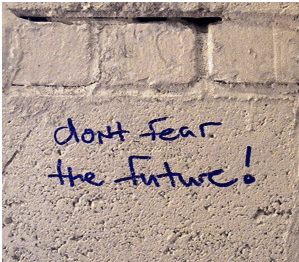 To live the future and be afraid of its consequences is not necessarily a contradicting reality. One obviously cannot predict tomorrow’s realities based on the past, but one can definitely predict rising emotional fears based on yesterday’s panic. Not a day passes without managers and leaders admitting to us their concerns and fears about the future. I am always amazed by how much energy we invest in being afraid of what may or may not happen tomorrow. The agendas, plans and events we cannot control, scare us humans especially if they threaten our livelihood or well being. In the “Good life phase”, it is within our comfort zone to say – I am what I am and it will stay that way for ever. The executives of Pan Am and TWA lived like this in the 80’s. Rulers such as Pinochet of Chile, Juan Peron of Argentina and Saddam Hussein of Iraq ruled this way. My parent’s lived this way in Eastern Europe before the Nazis invaded their countries. Last but not least, the high-tech industry is living through this phase these days like never before. An example I mention quite often is the story of Kodak. A giant company amongst the ones “Built to Last.” Ever since digital technology came to life, its existence and continuity became one big question mark. In Israel for example, Kodak purchased Creo. Creo, a successful Canadian corporation, years before, purchased the Scitex Corporation. It was definitely the innovator, credited for changing the world of printing for ever. Beyond Scitex’s missed opportunities and its sad story (which I could fill books about), I suggest that you kindly look at the chain reaction of this case that may evolve in the years to come. Beyond the question of whether Kodak will be there or not in the future, the story of the operation in Israel is one huge case study for the high-tech industry, the whole world in general, and Israel in particular. What is it that we hear quite often in the “high-tech corridor” conversations? Production is moving to China but Research and Development (R&D) stays in the country? If denial was a brick then I would gently say that we are building a skyscraper made out of bricks. Did we go so low in our denials and our cumulative fears to admit the truth? Do we really think that the Chinese are fools? Did we lose our brain power to see what was coming? Does any intelligent human being doubt for a second that sooner or later the production facility created in China will require an R&D arm in its back yard? So let me present to you one personal “fear” and one huge frustration. In a few years (sooner then later), Kodak will close its operations in Israel and maybe in other countries as well. The Chinese will own and run the whole cycle (R&D, design, manufacturing, marketing, sales, distribution etc). The consequences are grim… The huge frustration that I have in this case is that it could have been avoided if we were not afraid to admit the truth and realize what was coming. I sincerely believe, the future lies in the development of traditional and mid-tech industries, medical technologies and the development of sophisticated food production methodologies. If so, then countries such as Israel should courageously look at the truth and reality and realize that the greatness of the past will not prevail. A new focus should take place.